Finally opened my experimental eco print bundles. Each bundle was a slightly different technique. Had some knuckle biting while I waited for the prints to take hold but the results were good. Even in my inexperience, I did learn a few more things along the way. Have been collecting all kinds of plant material so I’m ready to prep a few more bundles. P.S. 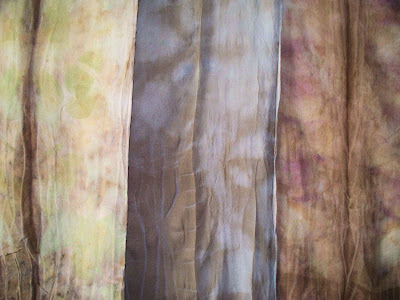 the color softness is primarily due to the fabric being silk chiffon and not silk habotai or cotton. Love the lovely soft colors – how did you get the green and the blue? The center scarf is not really blue. It’s a taupe (interesting how the photo editor picked up the blue). The other 2 are very true to the colors they are. The scarves on either end were ‘cooked’ with copper. The green scarf was pre-dye mordanted with alum. The leaves are roses and violets. Pat, the third one is my favorite. Experimenting is fun.